Critically Important Book Released on Opioid Crisis by Simon A. Zysman, Ph.D. Details treating addiction with high rate of success using breakthrough approach; includes contributions from several other specializing professionals. 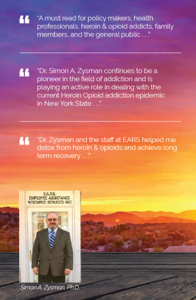 — Simon A. Zysman, Ph.D.
COMMACK, NEW YORK, UNITED STATES, July 11, 2018 /EINPresswire.com/ -- NEW YORK, NY - Dr. Simon Zysman is one of the nation's most prominent and well known clinical psychologists in the treatment of the addiction to heroin and opioids (the most commonly prescribed pain medication). 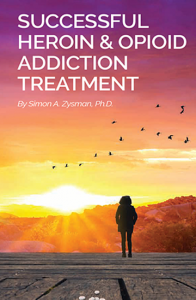 In Successful Heroin and Opioid Addiction Treatment, announced today, Dr. Simon A. Zysman shares his vast experience in recovery treatment as well as a deep look into his incredibly effective treatment program setting former addicts upon a positive road to recovery and a productive future. Opioid dependency is currently considered a lethal epidemic that has run rampant throughout the United States. The spread of opioid addiction is shockingly more by medical doctors inadvertently over-prescribing highly-addictive painkiller medication to their patients as opposed to illegal drug dealers. Dr. Zysman's success in treating this vicious addiction goes against the grain when it comes to the techniques utilized by many recovery specialists. Dr. Zysman's reputation is such that he was invited to address the New York State Senate Task Force on Heroin and Opiate Addiction on his groundbreaking treatment methodology. It was there Dr. Zysman was asked to write a book about the approach. Thus, a two-year effort began that has culminated in the publication of Successful Heroin and Opioid Addiction Treatment, an amazing look at the vitally important work of Dr. Zysman. This book released also includes contributions from several specializing medical professionals such as Steven J. Blander, M.D. Board Certified in Internal Medicine and Infectious Disease, Melinda T. Del Castillo M.D. Psychiatrist and Addition Medicine, Regina Neuman, M.D. Internal Medicine and Addiction Medicine, Steven M. Silverman, M.D. Board Certified in Addiction Medicine, Isabel M. Tolentino-Marasol, M.D. Board Certified Psychiatrist and Addiction Medicine, Farhaana Zainul, J.D., CASAC Health Law and Quality Assurance, Jacqueline P. Zysman-Weisfeld, Pharm. D. Pharmacist, Matthew L. Zyzman, LMSW Clinical Social Worker and Addiction Specialist.